Digital Champ Battle Boxing is a first-person-perspective boxing title that plunges players into the raw intensity of the ring! 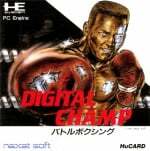 When it was first released in 1989 Digital Champ caused quite a stir. 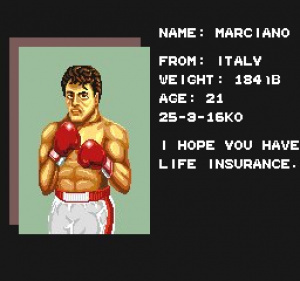 Boxing games up to this point had been graphically modest affairs; Punch Out! was (and some would say, still is) the title of choice for prospective pugilists thanks to its entertaining gameplay, but Naxat’s PC Engine game was more of a knock-out in terms of presentation. 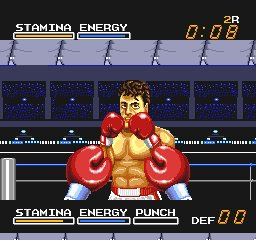 The sprites in Digital Champ are impressive even today; they’re large in size, boast plenty of detail and even animate quite well (one of them even bears more than a passing resemblance to Rocky). Sadly, the visuals are by far and away the best thing about the game, with the actual gameplay coming across as a bit tepid. The controls are simple enough. You have a button for each fist and the d-pad allows you to dodge blows and aim higher and lower punches. Holding down an attack button charges up a mighty uppercut, but actually landing it is a matter of luck rather than skill. More often than not the best policy is to mash the buttons and get plenty of quick-fire jabs in, which wears down your opponent’s health extremely quickly. Needless to say, it all gets old pretty quickly. Naturally, your opponents get tougher as you progress but the action never really gets the pulse racing like it should do. Although you have the ability to move around the ring, the viewpoint never successfully conveys this impression of movement and it often feels like your boxer is glued to the spot, swinging at thin air as your foe shifts out of range. The lack of options and gameplay modes seriously reduces whatever long term appeal Digital Champ might have possessed and at the end of the day it’s plain to see that like China Warrior, this is yet another early PC Engine game that was sold off the back of its visuals rather that its gameplay. The absence of a two-player mode further limits the appeal of this lacklustre game. It’s a shame to have to give Digital Champ such a negative appraisal because it does have minor moments of brilliance and the potential is undoubtedly present. Sadly this is just another title that could have been a contender, but unfortunately isn’t up to the task.